Welcome to our book’s website! We are glad you came! 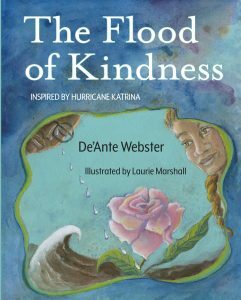 We hope our book will help there be more kindness in the world, especially after floods and hurricanes. It’s for kids who are going through big weather events. It’s also for kids who have lost someone close to them. The story is about what happened after Hurricane Katrina. In it, A boy’s memory of his best friend, who died in the flood, magically helps kindness return to New Orleans where anger, division and mistrust had taken over. De’Ante wrote it when he was 8 and we’ve worked on it for 6 years. We have lots of ideas for increasing kindness at our Kids Kindness Korner and we want to hear yours, too. If you’d like to set-up a Flood of Kindness Event, with a book reading, signing and activities, in your neighborhood, please let us know here CONTACT US.